Can I use my own domain with Countermail? Yes, if you have your own domain, you can transfer all email handling to our server. We can not host web pages for your domain (A-record), we can only host the email handling (MX-record) for your domain. You can't register domains through us, you must first do this through a domain registrator, we recommend Active-domain or Namecheap for common TLD names, for more unusal countries (TLDs), we recommend EuroDNS. We do not allow catch-all addresses, due to abuse. Using a catch-all address is never good, because you will receive much more spam emails. If you need multiple incoming forwarders, you can create aliases for your domain instead of using a catch-all. The address abuse@yourdomain.com will always go to Countermail's own abuse-account. You can not use domains which can be used for Phishing. If you try to use a domain for Phishing, we will close your account permanently. Unsolicited emails cannot be sent to an individual subscriber unless prior permission has been obtained or unless there is a previous relationship between the parties. The price for using your own domain is a $15 one-time setup fee per domain. If you want different logins (separate accounts with separate Inboxes and keys) you need to purchase one premium account per login. We have discounts if you buy 5 premium accounts (or more). A domain-alias is a anonymous forwarder to your Countermail account, you can both send and receive email from/to a domain-alias, but it shares the same Login-credentials and share the same Inbox and data, and if you add the domain-alias to your PGP-keypair, it shares the same keypair (optional). You still login with your normal Countermail account-name. You can create unlimited with domain-aliases. Domain-aliases are free, no extra costs. You can see your own domain aliases under Settings / Identities. A domain-user is a separate account under your own domain, the domain-user has its own login-credentials, its own Inbox, and its own keypair. It has no special limitations (as a domain-alias has). It's like a separate premium account. The first 7 days are free, then you need to pay for it, if you want to continue using it. You login with "yourname@yourdomain.tld" and with its own password. 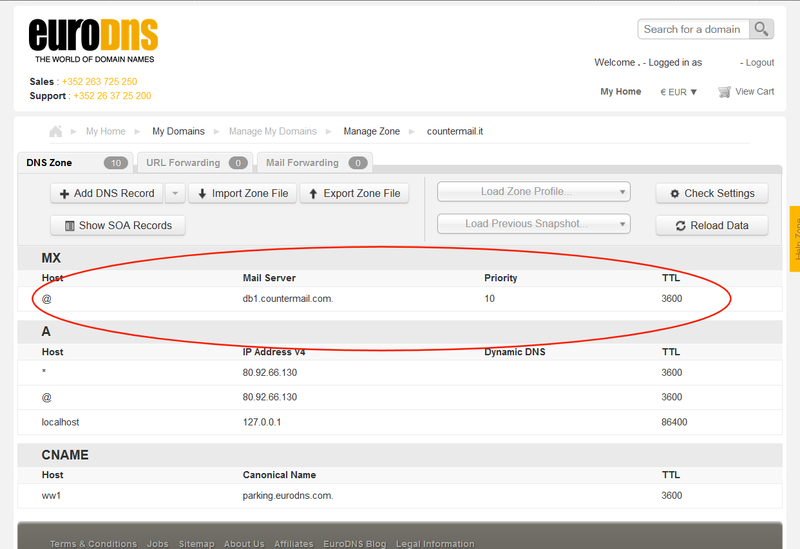 You can see your domain users under Settings / Domain panel. 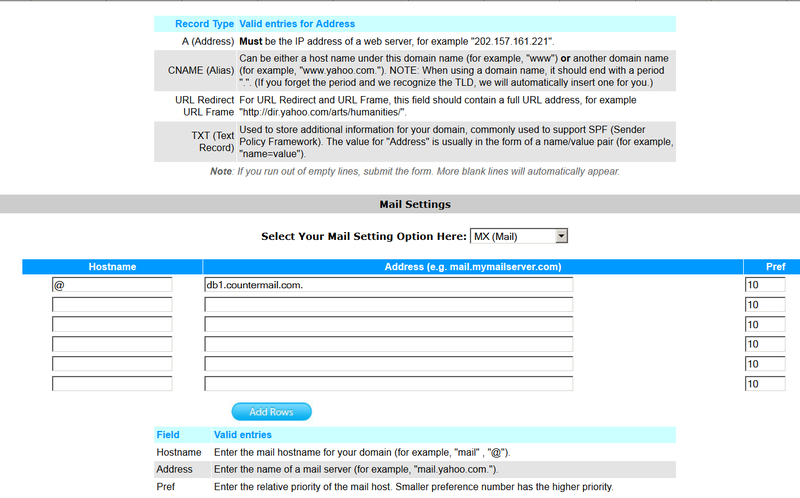 If you have a separate domain user, you must login with the full name: "yourname@yourdomain.com" to our webmail. If you only have domain aliases, you login as usual with your normal Countermail address. Remember that you can't register domains through us, you must first do this through a domain registrator, we recommend Active-domain or Namecheap for common TLD names, for more unusal countries (TLDs), we recommend EuroDNS. You should remove all other MX-pointers for your domain, only keeping the above. Changing the MX records will not affect your existing web hosting. 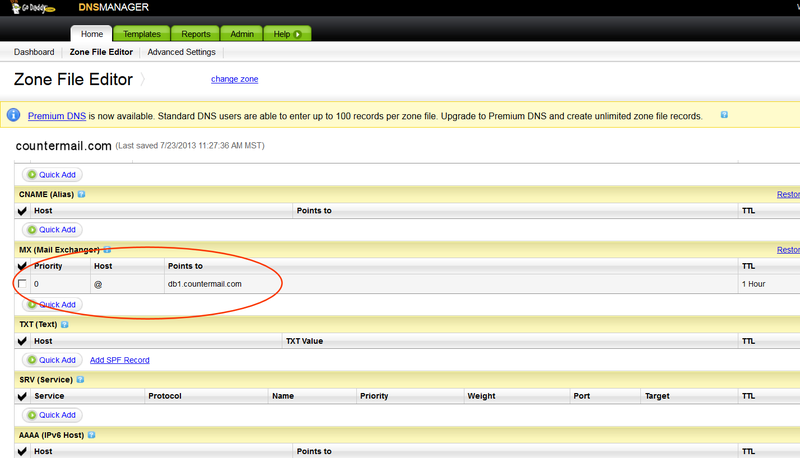 It is not necessary to point other DNS records (e.g. A records) to a different IP address, or to transfer existing web hosting. Please note that you must log out and log in once before the domain will be visible on your account. Now you have to wait until the MX-change is finished on your DNS-servers, depending on the DNS-cache, it could take a several hours. When the MX change is done, all emails will come directly to our server, it will not pass your domain registrator servers.